How many times did my mother try to warn me that "you get what you pay for"? I am very hardheaded; I have to learn things on my own. 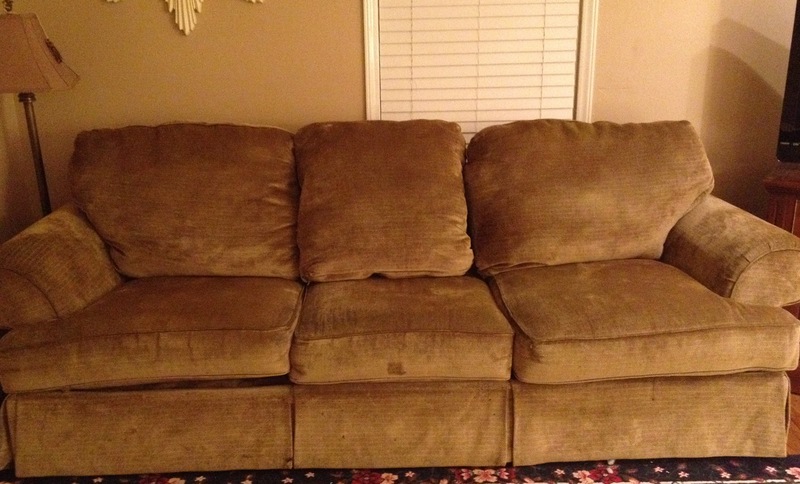 About 6 years ago my sweet mother-in-law offered to buy our family a new couch. It was much-needed, but my husband had just finished seminary and taken his first church (second career) and we had no money. Knowing we would need to begin opening up our home to members of our church, my MIL was probably embarrassed for us at the state of our (then) current couch, which used to be light yellow and had barely survived three young children. She sent us a check and off I went. I could have spent the whole amount on one well made couch at a nice furniture store, or I could buy a cheaper set consisting of a full-sized couch and matching love seat. Guess which I chose? Guess what decision I regretted?! The set has been a major disappointment. One end of the large couch sags noticeably, the cloth is wearing thin in many places and has actually worn through in several other places, and the sagging end squeaks when you sit down on it. 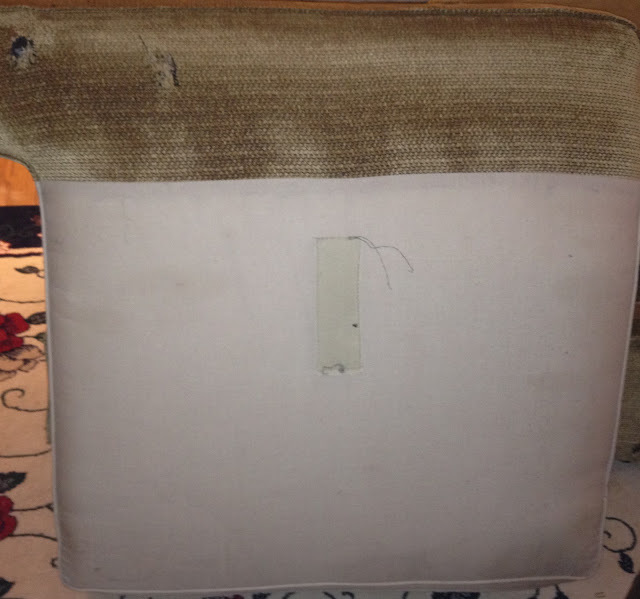 In addition, the back cushions are attached to the back of the couch rather than being separate, and the bottom cushions only have "good" fabric on one side and cheap, flimsy fabric on the underside. Those things mean we cannot flip the cushions in order to wear them evenly or to cover a stain. Bummer, huh? I wish I could say that I have learned my lesson and am now heading out to buy a new and better couch, but it just isn't in the budget. After looking at many blogs and YouTube videos in an attempt to learn how to make slipcovers for these two sad members of our den, I did just that: made a slipcover. Really. 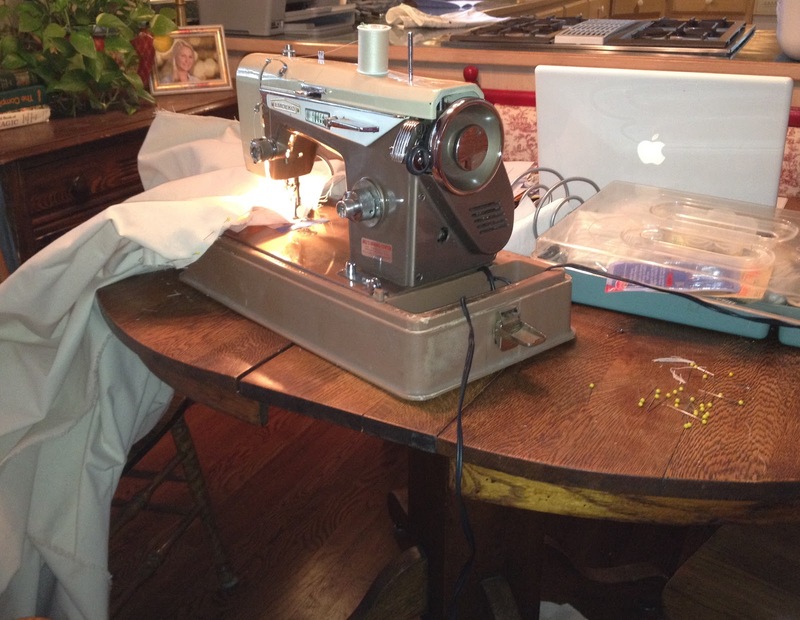 You must know that I am no expert seamstress. In fact, my only sewing skill is a straight stitch on a machine that is older than I am. 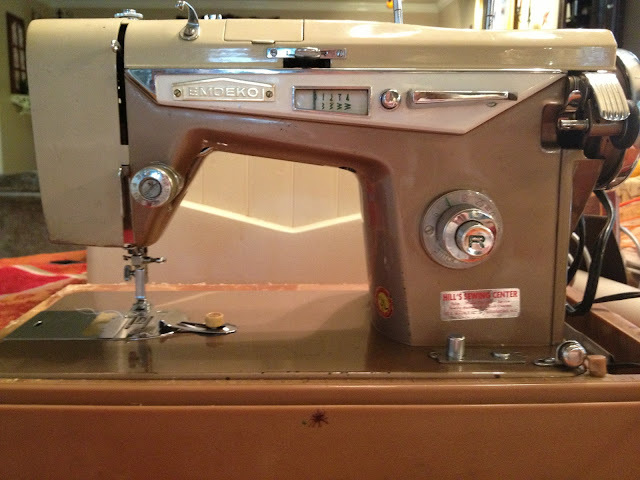 My mom gave it to me when she moved to a retirement village and retired her sewing hobby as well. It is as heavy as lead, but very solid, and it can sew a straight stitch like nobody's business. I don't have a sewing or craft room, so it has to sit in the basement until I need it. When that moment hits, my husband hauls it up the stairs and sits it on the kitchen table for me. I had been looking at pictures of pretty slipcovered sofas that inspired me to think that I might be able to transform my sad ugly duckling sofa into a happy beautiful swan, so I began to look at fabric. I knew that I wanted heavy duck cloth and did not want to spend much money since I did not know if this would be a complete disaster or not. The best price I found was online at Jo-Ann Fabrics - $97 for 20 yards ($4.85 a yard) and free shipping. If it weren't for some wonderful YouTube videos, I would not have been brave enough to try this. The ones I found most helpful were the ones by Miss Mustard Seed and Expert Village. Want to know how mine turned out? Tomorrow I will begin showing you the process I went through. You will not want to miss it! P.S. If you are getting anything at all out of my blogposts, would you do me a big favor and follow me? Just hit the "Join this site" button on the right side of my page. You can also get any new posts emailed to you directly by clicking on "Follow me by email." Thanks so much! ابعد عن القطع التي تتضمن العديد من الزجاج : وهذا كونها ستجبرك اما على فك قطع الزجاج ونقلها معزولة لاحقا، او نقل القطعة نفسها بكثير من الحيطة والخوف، وفي حال كان الزجاج مصمم خصيصا لتلك القطعة من حيث الالوان والشكل، فإن اي كسر فيه سيؤدي الى إفساد شكل قطعة الاثاث كاملة .